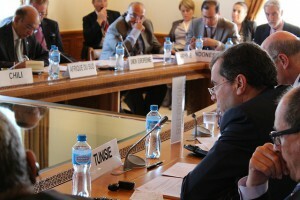 This event, in the “The Human Rights Council at 10 – improving relevance, strengthening impact” series, was hosted in the Morocco Room by the Permanent Mission of Morocco. In 2006, member states took a significant step in strengthening human rights as one of the three pillars of the United Nations and established (with General Assembly resolution 60/251) the Human Rights Council as the UN’s apex human rights body. Since then the Council has grown significantly in confidence and stature, as have its mechanisms. However, it remains a young body and it is clear that the first decade of its existence – its ‘formative years’ – will make a major contribution towards determining its future relevance, effectiveness and impact. Like those policymakers who steered the adoption of resolution 60/251, the Council’s institution-building package, and the outcome of the body’s five-year review, the current generation of diplomats and other stakeholders bear an important responsibility to use the milestone of the Council’s 10th anniversary as an opportunity to step back and make an honest appraisal of the nascent body’s achievements and challenges, and identify new and innovative solutions to equip it to better meet those challenges in the decades to come. With this in mind, on Friday 24th April, the Permanent Mission of the Kingdom of Morocco, supported by the Universal Rights Group, hosted an informal policy dialogue designed to provide an open platform for discussion and fresh thinking on how to strengthen the relevance and effectiveness of the Council. The policy dialogue offered an informal space for states from all regions, as well as NGOs and UN human rights experts and officials, to reflect on the achievements of the Human Rights Council as it looks towards its 10th anniversary in 2016, and to consider and exchange ideas on how to improve the body’s relevance and impact in the years ahead. The policy dialogue was the third of three, held during February and April, on different opportunities and challenges facing the UN’s human rights pillar. Questions and ideas generated during the dialogues will be fed into a high-level informal retreat to be organised by Norway and Switzerland in Glion during May 2015. An informal draft report of the meeting, which was held under Chatham House Rules, will be available soon.